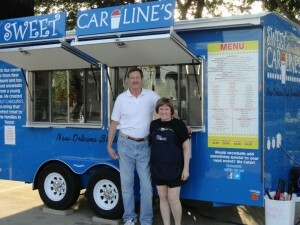 Sweet Caroline’s Snow Shack opened up last week in the parking lot of the Texaco Express Lube at 7120 Burnet Rd. (corner of Burnet Rd and Greenlawn Pkwy). This is one of six Sweet Caroline’s located throughout the Austin area. They serve New Orleans Style Snowballs with over 50 flavors and multiple toppings to choose from. Check them out. Hours are Monday-Friday, 2pm-Dark and Saturday & Sunday, Noon-Dark. Photo on left is owners Les and Pat Wittman in front of their new trailer. You can learn more about Sweet Carline’s on their Facebook page.